Thanks. They’re my lovely permanent rooftop residents, although not-so-lovely in the breeding season with all their noise that starts immediately the sun rises! Thank you, Dale 🙂 Why not have a go penning a haiku, yourself? They’re great fun to write. I looked up the “how-to”…. I dunno… may just have to try my hand!! Look up several “how-to” articles, as there are slight variances in opinion about syllable counts etc, and it’s interesting to read about the different approaches — traditional Japanese haiku versus modern English haiku. All types are valid, as rules are there to be broken, if you so wish. Just go wherever the Muse takes you. I usually stick to the more traditional 5-7-5 syllable lines, sometimes dispensing with punctuation: sometimes not. If you’re sharing your WordPress posts on facebook, of course, your haiku will reproduce as one continuous line, which can make a non-punctuated haiku look like gibberish or some sort of experimental writing! Good luck, Dale, I look forward to seeing your first haiku. Perhaps place a link to it in “comments” under one of my haiku. Good to know on the FB count!!! we stayed at a house in Normandy last Fall and, in the evening, there were hundreds of Jackdaws in the field near us. I loved hearing them but then, I am partial to crow birds. They are bold, intelligent, and characterful birds. I love their blue eyes and the way they strut about, allowing you within a few paces of them, but the seagulls round her treat them with great respect! My mother, who’s a great bird enthusiast, has a jackdaw box installed on her roof. It runs in my family loving birds of the crow family. My daughter used to, and still can, talk to the crows. She can stand in the middle of the woods and make their noise exactly, so they all reply. No idea what they’re saying back, but they seem happy enough. I’ve never heard of Jackdaw. I envy people who live where there’s a large variety of wildlife and birds. 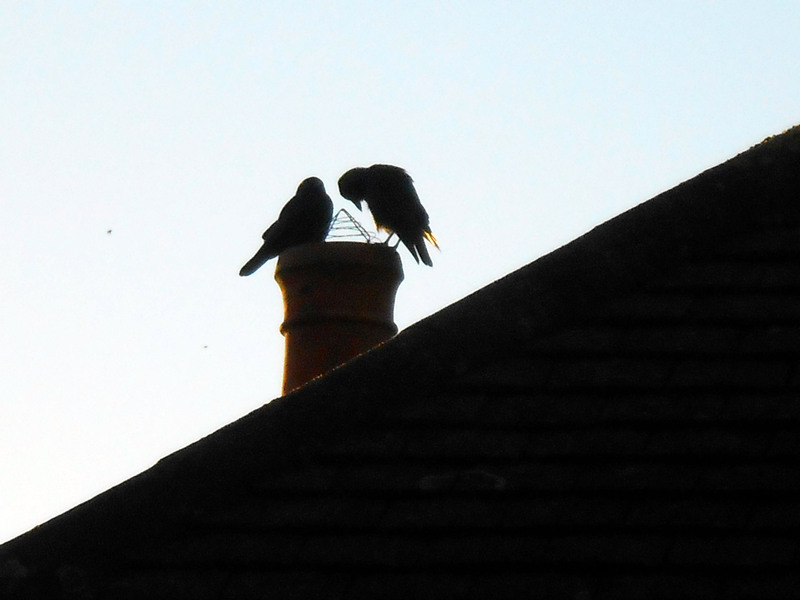 Jackdaws are of the crow family, and I expect you’ve heard of those birds. Yes, I’m very blessed with all the birds and wildlife around me. Do you live in the middle of a city without any green space? In the UK, even in cities there are parks and gardens. Have you ever lived anywhere that has had wildlife and birds? So sad for you not to have any around you. Nature can be such a healing presence, provided the creatures aren’t too fierce that live in your locality. I live in NY. We have trees, flowers and grass. The wild life we have are sparrows, squirrels, mourning doves, racoons, starlings, pigions and seagulls in the winter. We use to have crows but I haven’t seen any in years. We found a possum once. Of course mice and rats. When I was a kid we use to have rabbits, frogs and garder snakes and I saw hummingbirds. When I lived upstate I saw a variety of birds, skunks, deers and such. When I visit my sister I get to see interesting animals. We have parks with wooded areas there is a list of creatures to look for but they hide from me. Sorry I was so wordy. Not too wordy at all:-) That was really interesting. I’m glad to hear that there are some animals in NY. I’d love to see a racoon. To spot wild animals generally, you need to be very quiet and patient, and perhaps invest in some binoculars to espy the shyer ones. The most likely time to see them is very early in the morning, or at dusk, but I suppose the parks aren’t open then as they’re often locked when it’s dark in cities. I except you relish the times when you visit your sister. Thanks for sharing. I do look forward when I see my sister. The raccoons adapted they live in the sewers. Your haiku is so perfect for the photo, Sarah. I really feel for you, being woken up so early by their raucous good mornings. I’m quite an early riser, Sylvia,and prefer their noise to the sound of an alarm clock waking me up (although jackdaws are fairly quiet in November). My husband always worries about birds damaging the tiles, which means he often complains about birds wearing hobnail boots on the roof. More often than not, it’s those pesky, cranky seagulls, or magpies, rather than the less belligerent jackdaws. they are planning something!! Great photo and haiku my dear!! Thank you, Cybele. They do look as if they’re contemplating a bit of mischief! It’s amazing how much noise tiny birds like house martins make. They’re very pretty, though, aren’t they? Birds or no birds, I usually decide what time I’m going to wake up and that’s what happens. On the rare occasions I set an alarm clock (just in case), I wake up a couple of minutes before it goes off.